In our house, the summer months are all about living without a definite schedule…we seldom set the alarm clock. However, while we enjoy the relaxed vibe of the summer, I still know it’s important for my girls to keep on learning throughout the summer. One of our favourite places to learn is in our kitchen. We spend so much time in our kitchen it only makes sense to take advantage of the time we spend in there. 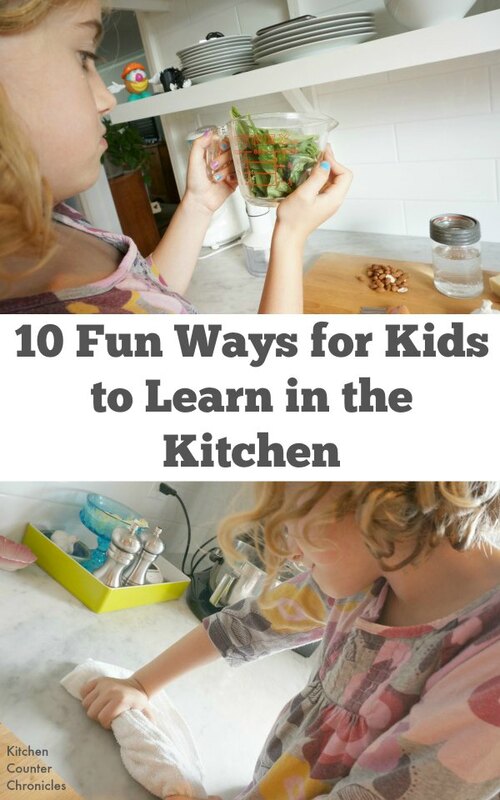 So, here are our top 10 ways for kids to learn in the kitchen this summer. Reading ~ There are plenty of opportunities for kids to read in the kitchen. Whether it’s reading the recipes or reading the product labels, kids can find ways to challenge their reading skills. A fun activity to get the kids practicing their reading skills is to think up a food you want to eat, for example “strawberry shortcake”, have your child grab a cookbook and read through the index to find the recipe. Social Skills ~ Turn off the computer and television and spend some one-on-one time with your child in the kitchen. Working with a recipe and cooking a dish is all about team work and cooperation. Each person has to listen to the other in order to reach the end goal…a delicious meal. These skill are so important in the development of a healthy child. Writing ~ When it’s time to head to the grocery store, let the kids write the shopping list. Start off the summer with the kids writing the easier words and as fall approaches challenge the kids with the more difficult words…like watermelon! 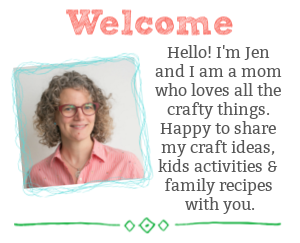 I also love sharing my recipes with my friends, let your child copy down recipes on recipe cards to gift to others…a great way to practice writing. Fractions ~ When I asked my girls how they learn in the kitchen and the first thing they both said was “fractions”. I love this response because I always had such a hard time with fractions when I was a kid. 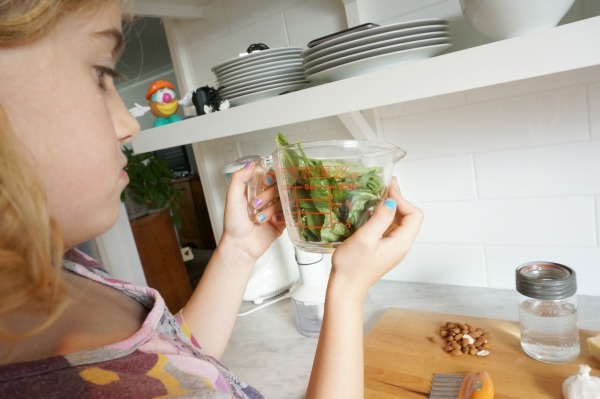 Simply having your child choose the correct measuring cup is a great introduction to fractions. Asking your child to portion out the dinner is another way to learn about fractions. How can you make 4 equal bowls of salad from one large bowl? Fractions! Measurement ~ What unit of measurement is used when dealing with a liquid? How about when you want to measure flour? Which is larger, a tablespoon or a teaspoon? 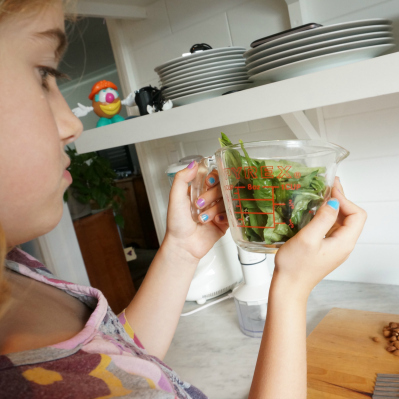 Hand over the measuring spoons and cups and let your kids explore measurement in the kitchen. Patience ~ Pop the cookies in the oven, set the timer and wait patiently. Waiting for 8-10 minutes seems like a lifetime to a child, especially when they are waiting for their favourite cookies to bake. Patience is a virtue and in the kitchen you need a lot of patience. Bonus: It’s Fun To Wash The Dishes ~ Yep, when kids wash the dishes it’s actually fun! 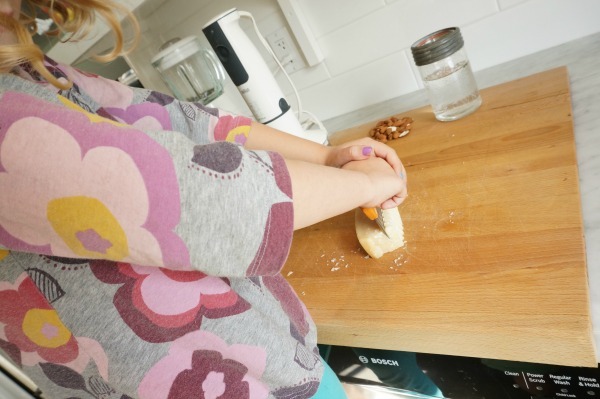 The water might end up all over the counter and the dishes might not be as clean as you like, but your child is learning an important life skill. Start them early! 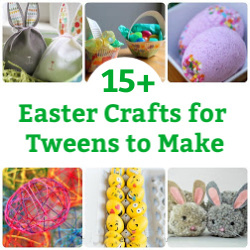 LOOKING FOR OTHER FUN WAYS TO CONNECT WITH YOUR FAMILY? 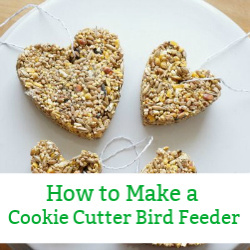 BE SURE TO CHECK OUT KITCHEN COUNTER CHRONICLES ON FACEBOOKAND PINTEREST. They also learn how to maintain a kitchen properly, through the cleanup. Mine (even the 5 year old) know to wash the pans and cutting boards they use, sweep and mop the floor, change the garbage if needed, and wipe down the countertops. They’ve done it so often that it’s automatic. Great post. It’s so true. I really only bake with my girls, just because dinner always seems so rushed, but I suppose it doesn’t have to be that way on the weekend. We can all (dad included) can get in the kitchen to make a meal together- big plus is, they might actually eat it if they helped to make it! Thanks for the post. My girls love to help me in the kitchen, and sometimes I’m too controlling (and too much of a neat freak) to let them help. This summer, I really want to give them an opportunity to do all of this great learning that you’ve mentioned here…and maybe we’ll even eat at home more often! Congrats on being included on the SavvyMom influential list!